All I was able to catch of last night’s game was the 9th inning. The links provide the basics. Have to point out, however, Taylor Motter’s 3 stolen bases, double and two walks. He was playing second base last night. And there was the thrill of closer Ronald Belisario, after two quick outs, letting runners get to second and third base before getting the third out. Good for the listener’s heart. As regular readers know, I love trying to put together pictures of how the Bulls are doing. What I mostly like to do is find a way to show a trend, and I prefer trying to describe team stats rather than individual stats. Today’s chart is an example of that way of thinking. Rather than a static standings box, I like seeing where a team has been by showing games above/below a .500 win/loss average. That gives you a quick look, for example, at the great run the Bulls have been having over the last week. And it’s a quick glance at how they are shaping up against the rest of the division. To relate back to the usual table, each tick mark in the spread between teams is ½ a game. 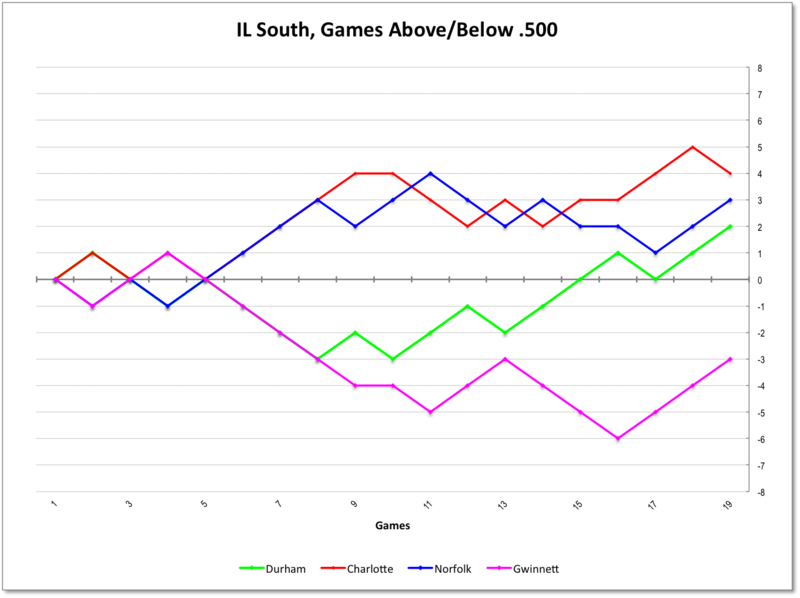 The Bulls are, thus, 2½ games ahead of Gwinnett, a ½ game back of Norfolk, and a full game back of Charlotte, just as it shows in the conventional standings.